Last week I was driving home from work and thinking about what to make for dinner. We hadn’t been to the grocery store in over a week, esophagitis so there wasn’t much to work with – 3 kinds of mustard, viagra 40mg 2 kinds of jam, 5 types of hot sauce, pickles, sauerkraut, eggs. I was thinking we might just have to have fried eggs with sauerkraut and condiments, when I called my mom and mentioned my sad situation. I wasn’t fishing for a dinner offer. Truly, I wasn’t! But then she told me she had a big pot of leftover pasta with chickpeas, sausage and kale and did I want to swing by and pick some up? Chickpeas, sausage and kale? On pasta? Sounds like a most perfect dinner (especially the night before a 5 mile run). And it was! The chickpeas were nicely toasted in olive oil, giving the dish a slightly nutty flavor. Sausage, kale, tomatoes and garlic round it out perfectly. I loved it so very much that I made it again yesterday. It’s everything I could ever want in a weeknight dinner or lunch. Set a large skillet over medium-high heat. Once it’s hot, heat the olive oil, then add the chickpeas and sausage. Cook until both the chickpeas and sausages start to brown a bit – about 8 – 10 minutes. Don’t worry if the chickpeas stick to the bottom of the pan a little bit. Add the garlic and cook for an additional minute or two, then add the tomatoes and kale. Using a wooden spoon, scrape up any sausage and chickpeas that stuck to the bottom of the pan. Cook for about 8 minutes, or until the kale is wilted and tender. Remove from heat and set aside. While your chickpeas and sausage are browning, make your pasta according to package directions and cook until almost al dente. Drain and toss with the contents of the skillet. Drizzle more olive oil if your pasta looks too dry, then serve and sprinkle with grated (or shaved) Pecorino or Parmesan cheese. 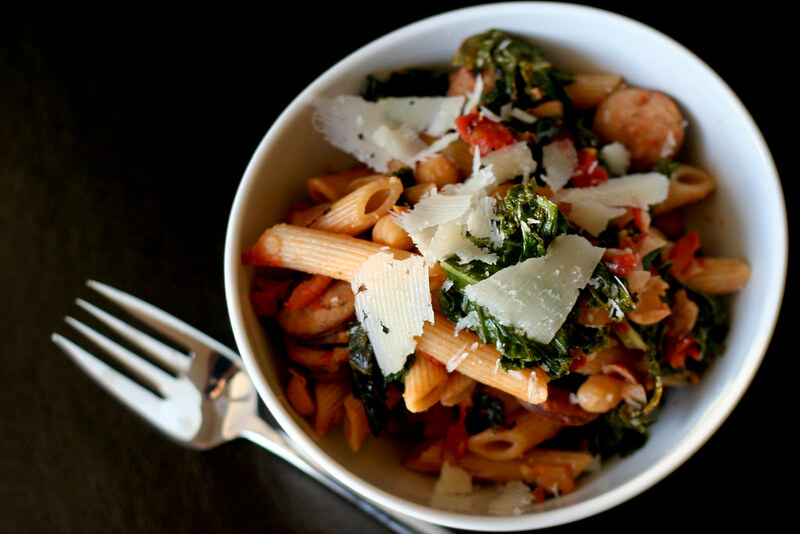 Kale and sausage with pasta has always been one of my favorite combos. It sounds delicious with chickpeas! Gotta love it when mom come sto the rescue. This is one of my favorite combos! 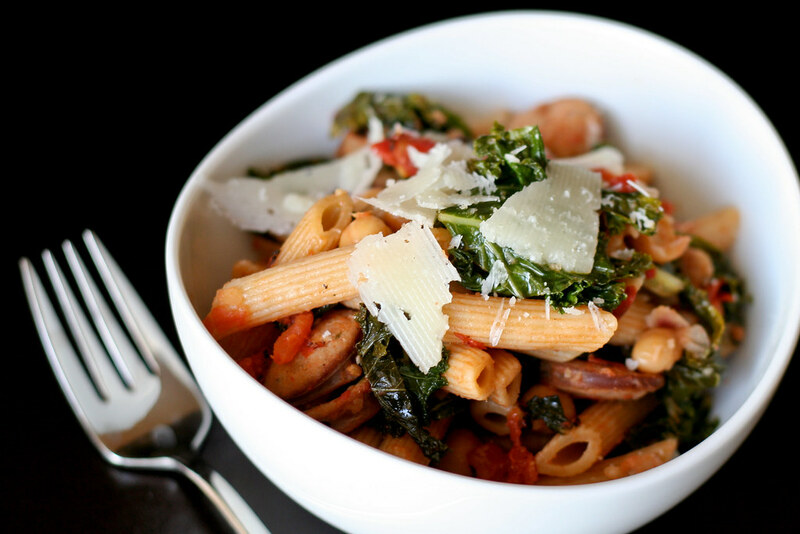 Sometimes I skip the pasta and just go for plenty of yummy sausage and kale and chick peas. Lately, though, I’ve been tryiong to eat more whole grains so have been stirring sauteed kale, cooked sausage and roasted chick peas into barley. Super tasty!